I guess you could read it without having read book one but I'd never recommended it with UF... A lot of the world building takes place in book one and to know where Kitty is coming from you need to understand what she's gone through. 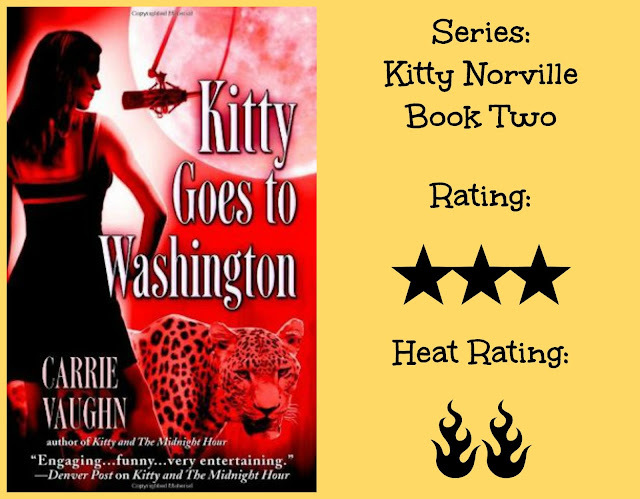 After reading the first book in this series, Kitty and The Midnight Hour, I wasn't really wasn't sure what to make of the series. I didn't like the pack dynamics, I didn't like that it took so long for Kitty to grow a backbone and the ending was kinda sad but I was intrigued enough to continue so here we are! I'm pleased to say that I liked book two more than book one but I still didn't love it. Kitty has broken from her pack and has had to basically take The Midnight Hour on a tour of affiliated radio stations or be killed for staying in Denver. 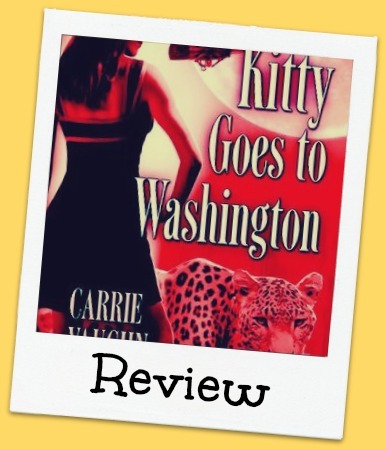 Being 'out' as a werewolf and a pseudo-celebrity because of her radio show, Kitty is summoned to give evidence at a government committee on supernatural beasties in Washington DC. Naturally, chaos and supernatural hijinks ensue as well as unethical escapades from politicians, scientists and journalists all working their own selfish angles with Kitty stuck in the middle. I liked Kitty a lot more in this book. She's grown a bit more of a backbone and she's just trying to live her life. We meet some Washington vampires, Kitty's lawyer Ben is more prominent and Cormac - a werewolf hunter and Kitty's friend - plays a welcome part, and I liked seeing Kitty's building relationship with them all. We meet other were animals and they show Kitty that there is another way of living. That weres can live without packs and that a pack doesn't mean abuse and I'm very I'm curious as to what Kitty ultimately does with that revelation for she's got to return to Denver at some point, right? I think the reason that the book was still only a 3-Star read for me was that even though there were lots going on I felt like nothing was happening. I was kinda bored. Too much page time was given to characters or events that served no purpose other than a momentary distraction. However, once again, I find myself in the position of wanting to read more. So I will definitely be reading book three. I found books two and three to be setting the scene for the full series. Book 4 is where I started to really enjoy the series, and I loved five, six, seven and eight! I'm up to book 5 now (haven't started it yet) and they're getting better! I think I'm in for the long haul! This series really gets good as it goes along. You really get to see Kitty's growth throughout the series. I can't pinpoint one book but as a whole I really loved Kitty after a few books in. I love Urban Fantasy, and can see where you'd need to read book one for world-building. I'm glad you were able to enjoy book 2 more than book 1, and that Kitty finally grew a backbone. Hopefully book 3 will be even better, and you won't be bored. I can see why you want to stick with the series and see where it goes. I'm up to book 5 now and it's getting better and better! I read the first few books in this series and I need to get back into it now. Its a weird one but I'm liking it. Another older series I haven't gotten to yet. I think I have a few on my Kindle though. I have heard good things about this series, but havent’ tried it myself. I think many UF series take awhile to get going. They often require patience in the beginning. Hopefully this will continue to get better for you. Its definitely getting better the more I read! Hate when that happens too much time spent on characters and plot when not needed. gosh it's been so long since I've last heard about this series :D it looks like one I would enjoy. It's always take a bit to start one. It's been on my TBR for years!